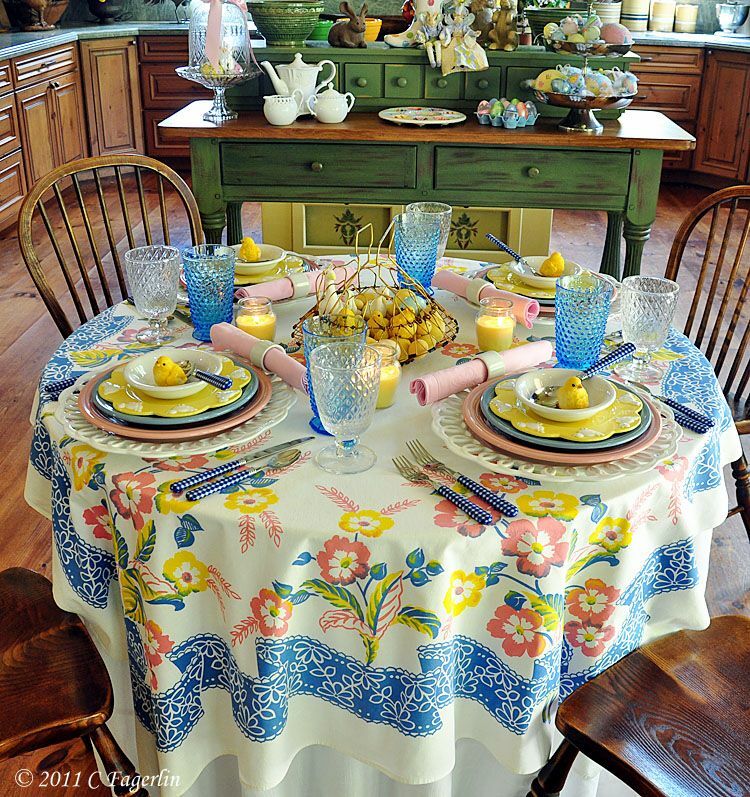 Another Easter table for your viewing enjoyment today! 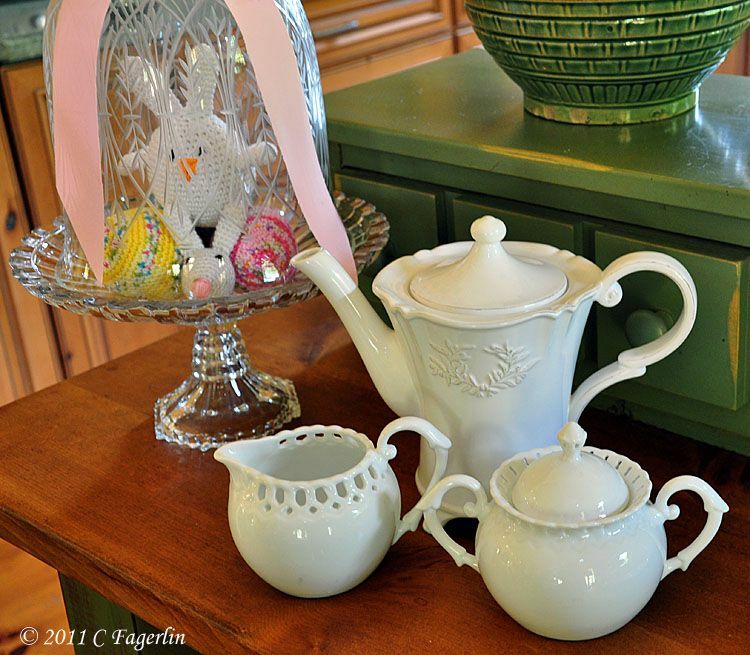 the next week for more Easter tablescapes. Beautiful table Candy, as always! 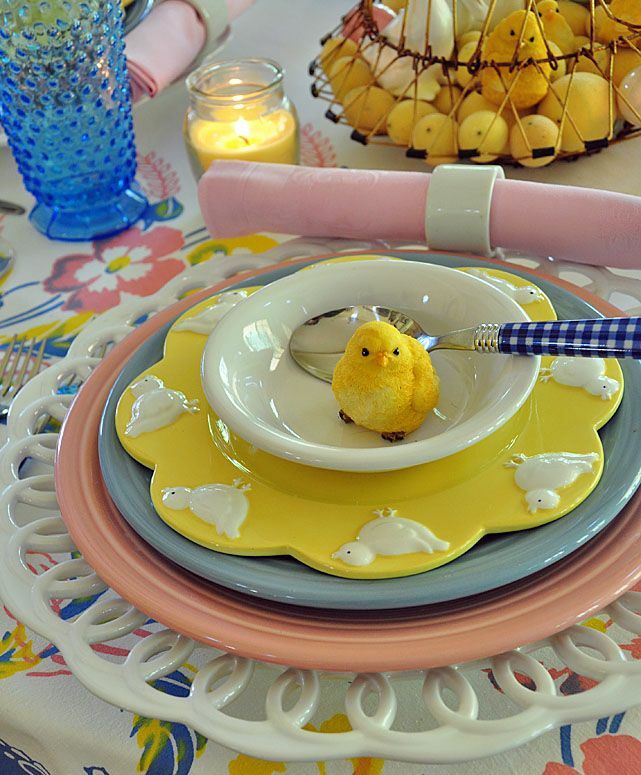 Really love your chick plates...so cute! Happy Easter. Gosh! 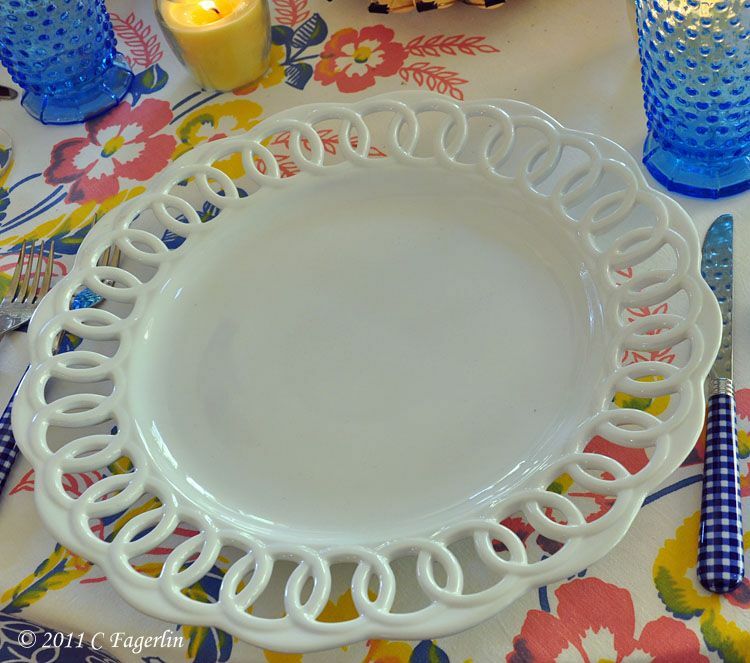 I love your tablescapes! Thanks for sharing!!! Candy ... wonderful! Love the chick and a person can never have too many bunnies!!!!! 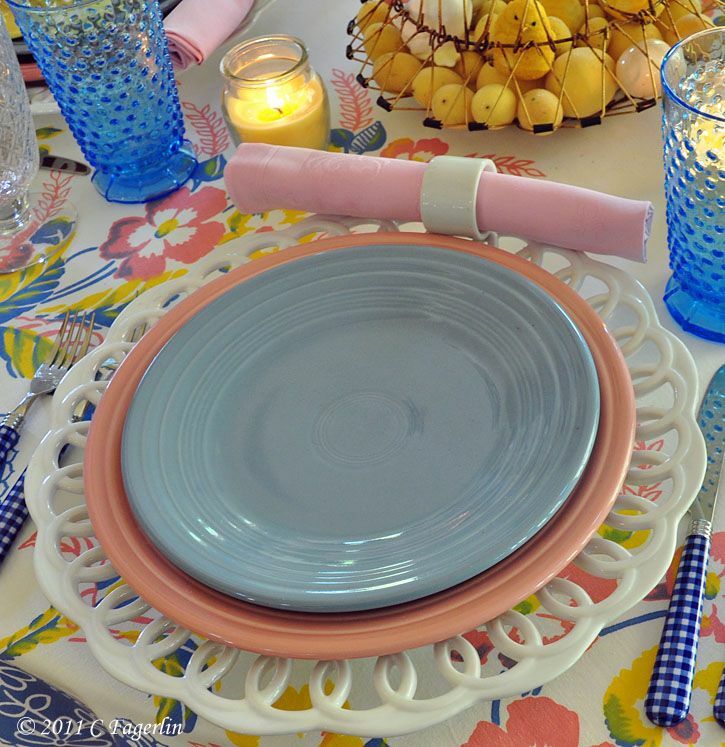 Candy, you always have the best tablescapes! I really can grasp your sense of fun and nostalgia and it makes me smile! 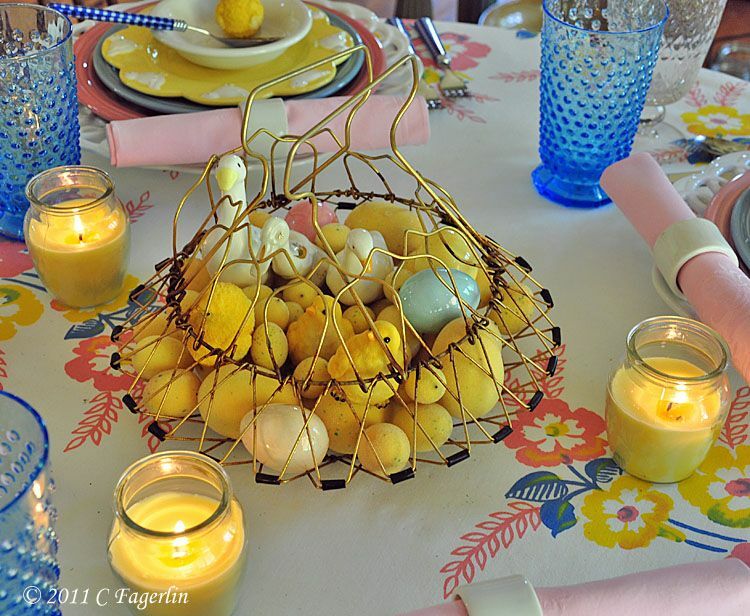 I love the basket of eggs and chicks and it really makes the table fun and whimsical. I may have asked before so please forgive me if I have, but I love the 4 tiered stand on the buffet, do you mind sharing information on it with us? 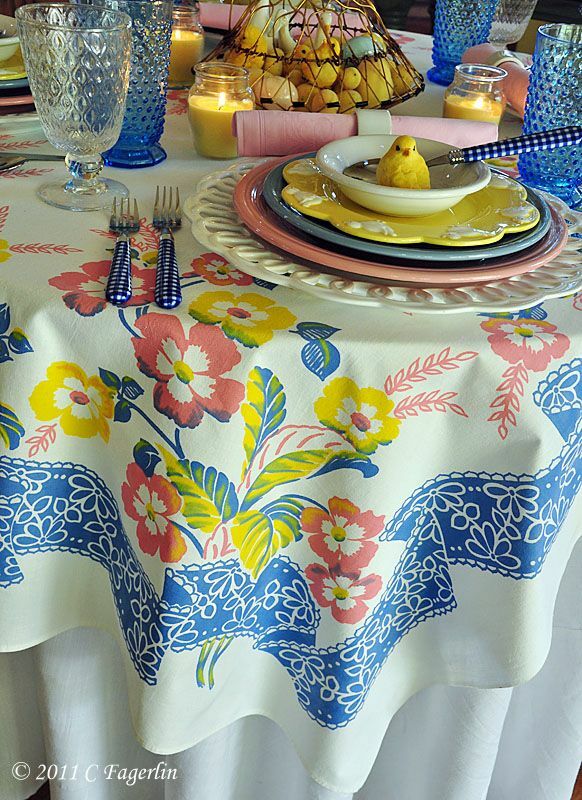 As always your tablecloth is beautiful and I love the blue glasses with the Fiesta. 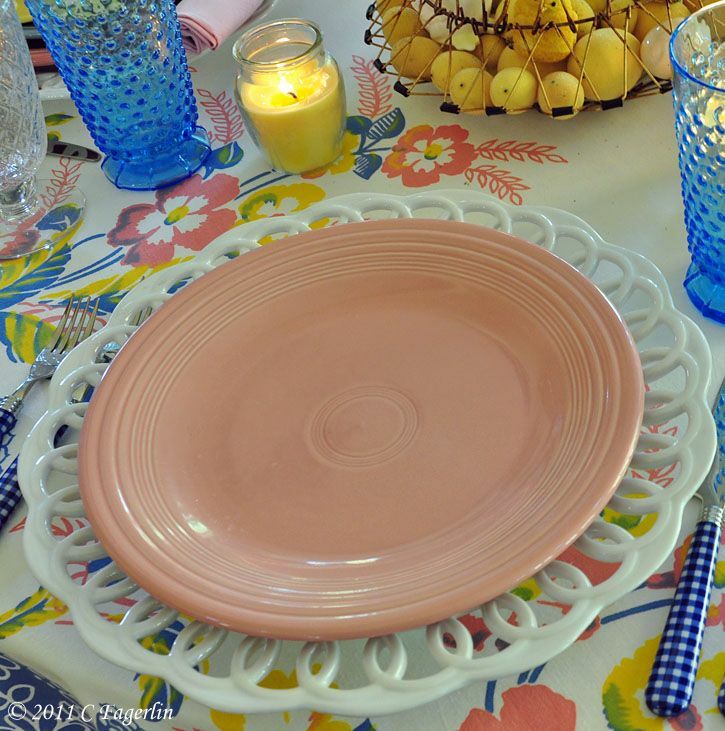 Candy, You have outdone yourself with this tablescape! 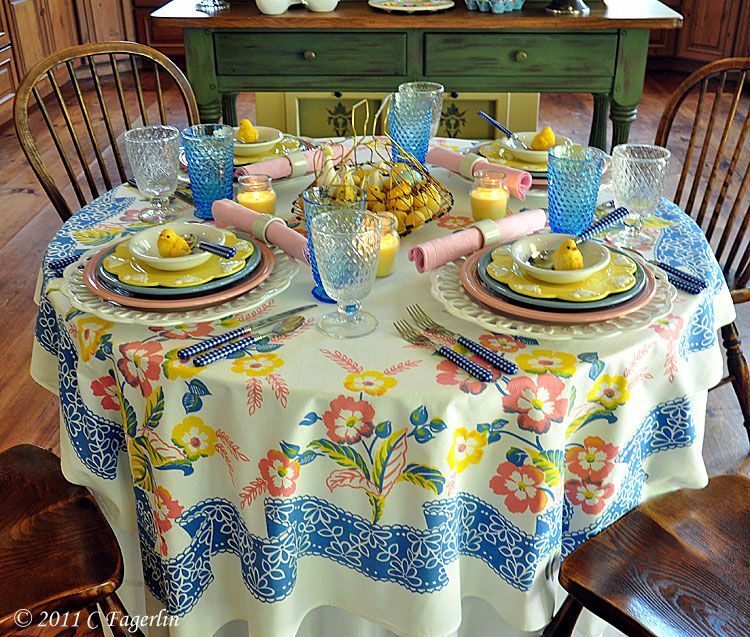 The vintage tablecloth is festive and I always love the use of milkglass on the table! Wow..this so so cute!! 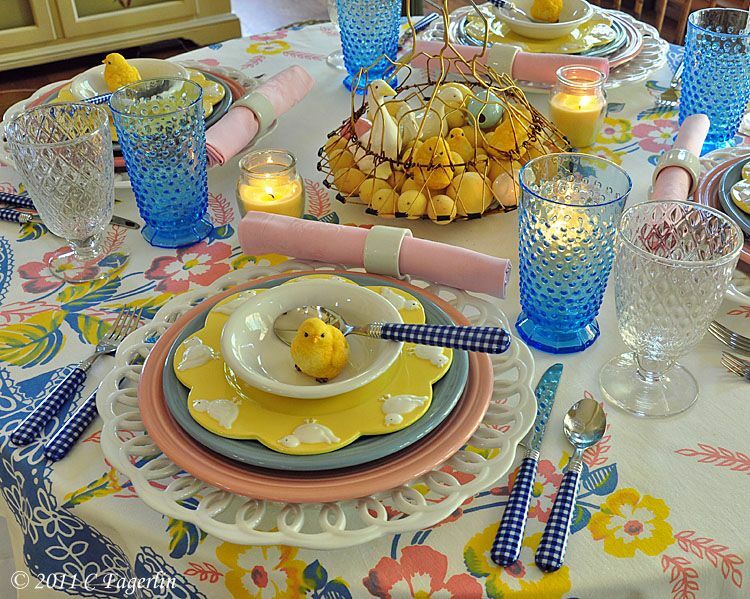 I love the yellow chicks, the tablecloth is fabulous too! 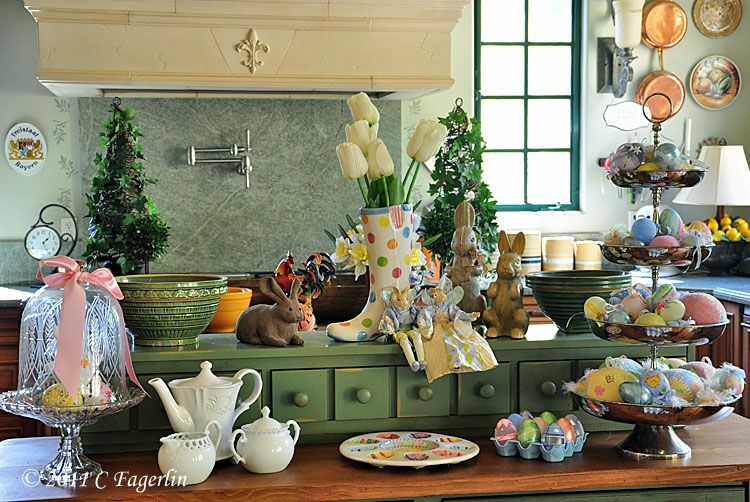 Well I just love everything..so beautifully put together with all those Easter accessories!! Spectacular!! LOVE LOVE LOVE your white chargers! They're lacy and modern at the same time! Great add to your table! Such happy chicks! Thanks for bringing to Seasonal Sundays. 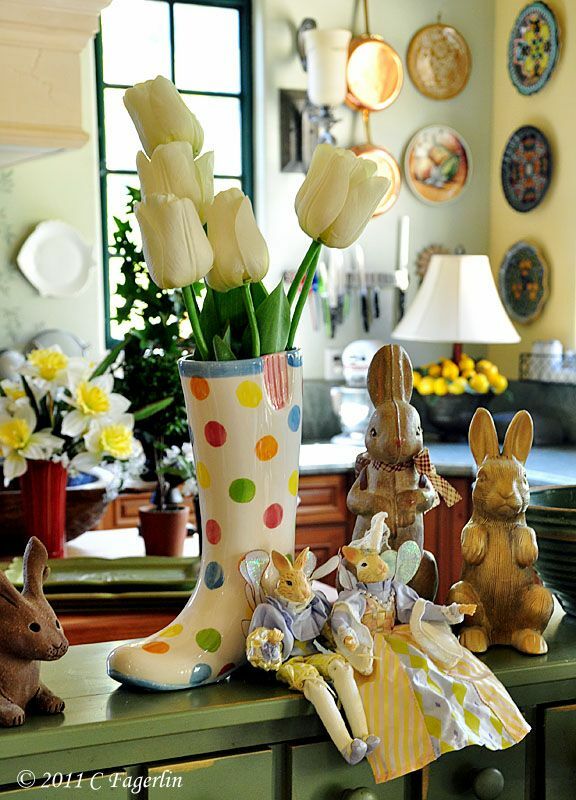 Your Easter table makes me so happy! It is adorable! 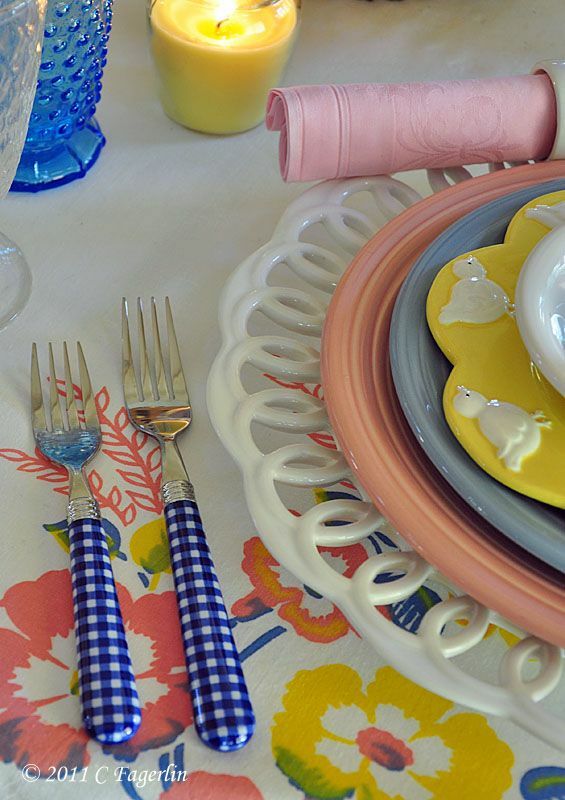 I love the vintage table cloth. I am visiting from Mosaic Monday. Candy, I'm back for another look at this colorful table. It is a favorite!!! 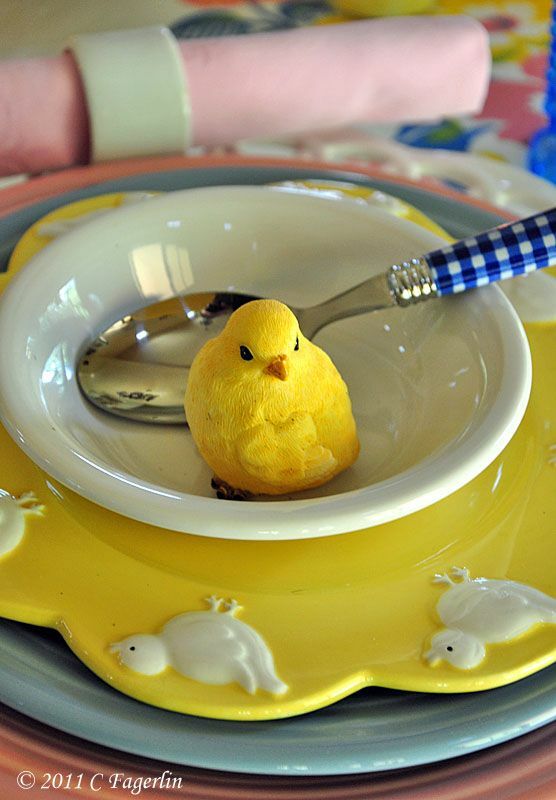 Makes me want to sit down and eat some peeps at your little round table! Gorgeous setting! So bright and inviting, my hubby would love this! Beautiful shots. Love the cute chick. Heavens!! This is amazing!!! I am loving every nook and crany... now if you would be kind enough to give me directions.. I could mapquest it and be on time for dinner! How darling! I love those soft blues! The chicks have landed on TLRT! I love the stylized florals on that cloth. 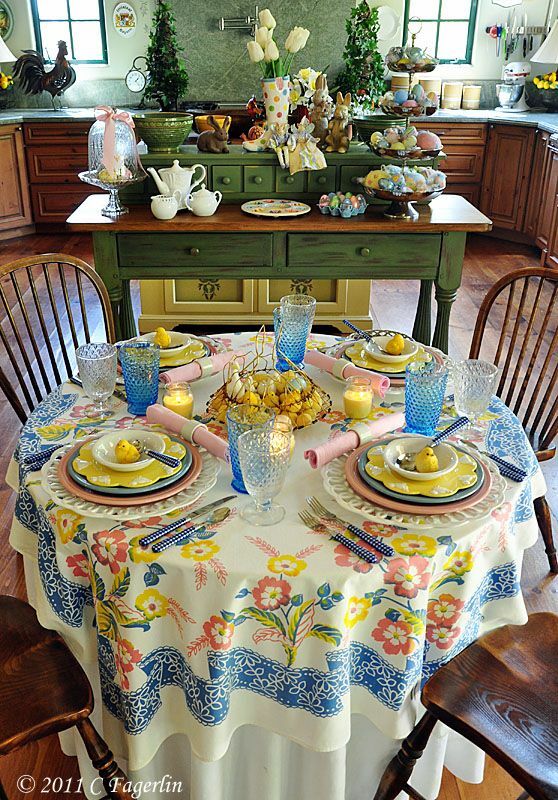 What a cute Easter tablescape. 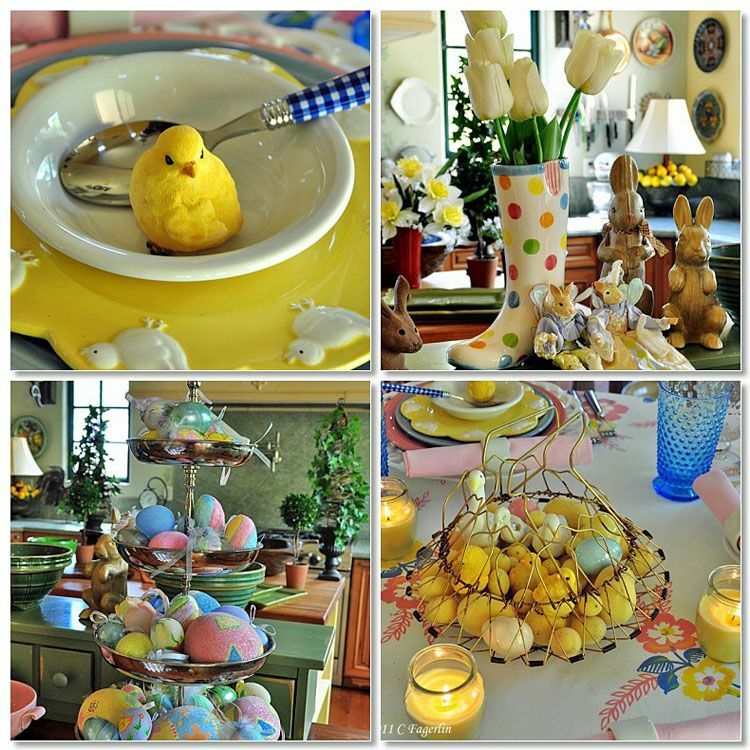 I love all the chicks and decorations. Just adorable. Happy Easter. What a beautiful post, I was oohing and aahing. 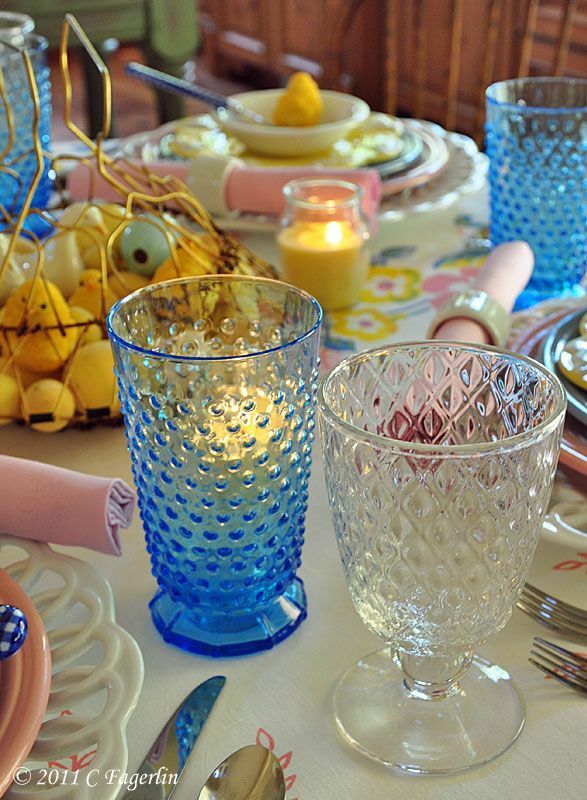 I love the pretty tablecloth and love pretty blue glassware. 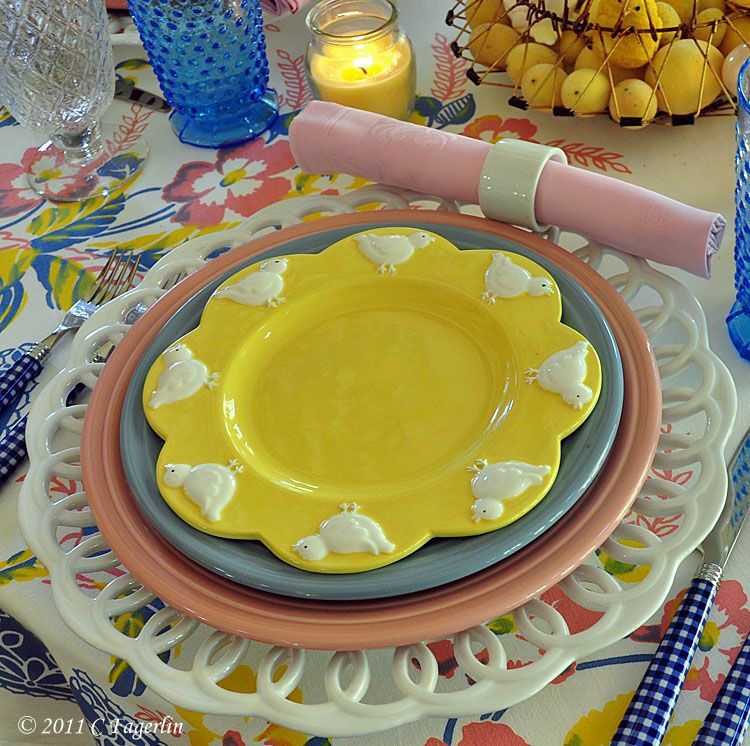 I love the chick plates and the tablecloth. Oh, how I enjoy visiting you. Thanks for visiting, always nice to hear from you.